With The First Annual Calgary Zombie Walk scheduled for this Saturday, I was inspired to set up a Zombie Mobs events group on Upcoming.org. Suitable for use with the Flickr Zombie Mobs photo group. zombie, zombies, zombie mob, zombie mobs, Upcoming.org, Calgary. From people being prevented from leaving the city on foot—turning them back at gun-point [another reference]—to blatant exploitation of the, predominantly black, poor, to what are effectively prison camps for survivors (with scarier implications for the more conspiracy minded).... It seems like practically everything that can go wrong there is going wrong—either through ignorance and extreme stupidity, or through wilful neglect. Countless attempts to help the people there have been blocked. All sorts of excuses are being conjured up to prevent people from recovering, from getting the basic needs of food, clothing, shelter. The abuses being heaped on the survivors are deeply disturbing. A very surprising amount of the media coverage, particularly the early coverage, didn't try to apologize for the government(s) responsible. Although that has inevitably begun to shift as the spin control comes into play. Meanwhile, the U.S. dictatorship is shunting the responsibility to help the survivors onto the charity of the public instead of doing everything it can. This is in stark contrast to the efforts of individuals who still have—unlike the Bush Regime—their humanity, who try to do everything they can to help without fretting over political or bureaucratic implications. Although, sadly, many who are willing to help are being blocked at every turn. And the long-term implications of this disaster are just as scary (if not scarier). There have been a number of very expressive pictures coming out, both actual and collaged. I've seen a number of them using the Bush guitar photo-op from a couple days into the disaster. The extreme expressions of racism, classism and unfathomable inhumanity in the (lack of) response to this disaster (and the creation of the circumstances that contributed to it) is beyond any reasonable comprehension. I will echo the sentiment I heard from someone recently that they wished they believed in Hell so they could believe that the people (ir)responsible would be going there. I woke up sick this morning (not a big surprise given how much stress and sleep deprivation I underwent last week). So, I've spent most of my conscious hours today messing around on the net. and started posting events to my Upcoming.org Calendar. So if you've been wondering what I've been up to, I'm up to my ears in election campaigning in B.C. I'm helping out the Green Party of British Columbia in their provincial election (and learning a lot that might be useful to us in Alberta in future elections). I've been sleeping on a boat while here. It's not as exciting as one might think since the water is fairly calm where the boat is docked - I don't notice any movement when I'm aboard. There have been some Herons hanging around the dock. I got a kind of neat photo of one just taking off. I found out a few days after I arrived in Gibsons that it's where "The Beachcombers" was filmed. I have to find a free moment to go down to the dock and get my picture taken - 'real tourist style' (you will not survive my tourist-style kung-fu!). 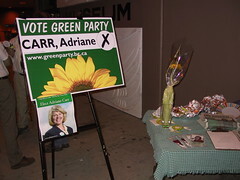 electioncampaign, greens, greenparty, bcgreens, bcgreenparty, travel, campaign, bc, BritishColumbia, bcelection. "A picture is worth a thousand lives..."
This painting by Alex Ross (one of my favourite artists working in comic books) puts it very clearly. bush, liberty, AlexRoss, vampire, president, usa. Well, that was probably the biggest, and certainly the most fun, Critical Mass Bike Ride I've ever been on. At least 82 people participated in today's ride! The cops didn't even come talk to us - let alone interfere at all. After giving up the rides a couple years ago when it got down to just me - a critical mass of one - I think I'm going to be trying to go again regularly. Hopefully we'll continue to see a lot of people coming out. 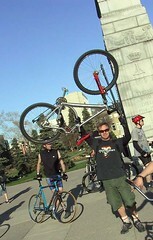 CriticalMass , bicycle , bike , EarthDay , Calgary , protest . Photos: My Critical Mass photos. I've just set up an RSS feed for this blog. I'm using the free FeedBurner service. This feed also includes updates from my del.icio.us web links and my Flickr photography. If you subscribe to my old Atom feed, please switch over to the new feed. In his San Francisco Chronicle column, Jon Carroll has posted "the first communique from" Unitarian Jihad. Some radical sweaters and other political knitting. Of particular note is The Body Count Sweater. 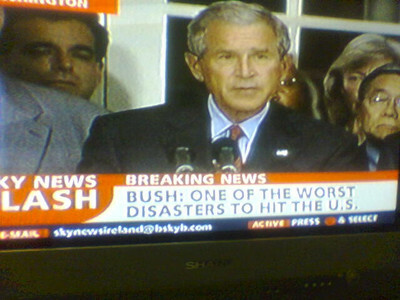 It enumerates the estimates of Iraqi civilian and U.S. soldiers who have died in the U.S. invasion and occupation of Iraq (up to March 14, 2005). knit, knitting, sweater, radical, political, Iraq, antiwar, RKC, RevolutionaryKnitting, RevolutionaryKnittingCircle. 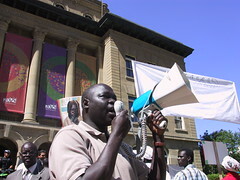 We had a very successful march and rally in Calgary to mark the second anniversary of the most recent U.S.-led invasion of Iraq. It's always hard to measure numbers above 100 people - but I would figure it was certainly over 300 who attended. Now, considering how terribly cold it was, that's a great turn out! I had my friend Juliet Burgess take my cameras (still and video) for the event since I was busy with organizing and M.C.'ing. Unfortunately, she somehow managed to not get a single picture of me at the event - although the many pictures she did take are great and turned out better than mine usually do. I haven't checked the video yet, and assume I'm on there, at least [he said with a smirk]. peace, antiwar, anti-war, activist, activism, protest, rally, march, Calgary, PeaceCalgary, March19. Tagging, the (bad kind of) evil cousin of graffiti, is a scourge - a plague - that offends my senses. Years ago, when I could still afford to risk engaging in illegal activities, I spent some wonderful times creating graffiti with friends. There was the excitement that came from "breaking the rules" - but there was also delight in creating something, in transforming the space around us. With our graffiti, my friends and I always tried to either say something or create art in unexpected or unapproved spaces. A couple of weeks ago I came across a graffiti scrawl - next to some tags - that I found myself laughing in agreement with. It had an arrow pointing to the tags and said "A fine example of useless s***". Tagging doesn't amount to anything positive - it's just ugly scrawls that express nothing more than laziness and disrespect. Taggers can't even be bothered to say anything. I'd rather see an ugly scrawl that says something - even if I disagree with what's being said. I mean, if someone's going to go to the effort of scrawling on a public space, they might as well do something meaningful with it. There have been some wonderful stencil graffiti art pieces going up in Calgary over the past few couple years, and there's a long tradition of artful, poetic and challenging posters pasted, graffiti-style, to all sorts of 'unauthorized' surfaces in the city. The unfortunate thing is that many lump this wonderful art in with the taggers - decrying it all as just vandalism. Maybe if the taggers stopped being stupid navel-gazers and put a little thought into their work, we might be able to see graffiti emerge as a strong and positive force for dialogue in our community and for the transformation of the isolating structures of the city into something less oppressive. On Sunday night I was visiting a friend whose neighbor has been living with a violently abusive partner. Things came to a head that night and she called the police to have him taken away. Afterward, she came over to my friend's place for some support. It was incredible to see her emerging from the fog of the abuse and finding a sense of her own power. In standing up for herself, she was able to begin the process of reclaiming her sense of self and her independence from her abuser. As we talked about what had happened, it was wonderful to see the effect of putting names to the various aspects of what had happened to her, and what she had done. She'll have much work ahead of her to fully break away from the deeply damaging emotional crap the abuser did to her, and to fully heal from it. But, it was tremendously inspiring to witness her strength and empowerment that night. After about 9 months of organizing that saw numerous big challenges, hurdles and personal crises, the big event is finally complete. This Alberta Social Forum event had a lot of successes and a few disappointments. While we were far from the level of inclusivity we had hoped for, there were some great stories. 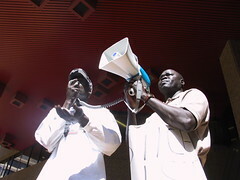 The presence and full-inclusion of members of the deaf-blind community was very exciting. Additionally, a self-advocate from the developmental disability community reported really enjoying the sessions he attended - with no feelings of exclusion. Attendance was lower than we had hoped, but we kept hearing from participants who really enjoyed and valued the sessions they went to. In the end, there were over 40 sessions offered on Saturday and Sunday. I helped or presented at 5 of them - including a session on Craftivism for the Revolutionary Knitting Circle. There's still a tremendous amount of work to be done to turn the Alberta Social Forum into a broad-based process for the people of Alberta, but this weekend event has certainly helped bring it a little closer. activism, activist, ASF, WSF, AlbertaSocialForum, SocialForum, WorldSocialForum, forum, Alberta. activism, activist, ASF, WSF, SocialForum, WorldSocialForum, forum , Alberta, FFwd. The Southern Alberta Lego Users Group took top honours at the Supertrain 2005 Model Train Show in Calgary, this weekend. My contribution was a river canyon with train bridge [photos of my Lego River Canyon and Train Bridge]. I had a couple of very sleep-deprived nights trying to finish it off right before the show. As it was, I wasn't quite finished when the show opened, so finished it over the first hour or two of the show. That actually turned out okay because people actually were quite interested to watch the display being built right in front of them. My thanks to the rest of the SALUG members who made the project so much fun, built great models, and contributed to our success this year. We've been invited to a few more train shows this year, so there's lots more fun ahead. Lego, AFOL, train, SALUG, modeltrain, Supertrain. SALUG, the Southern Alberta Lego Users Group, has a massive display in the Supertrain Model Train Show again this year. I'm super exhausted because I spent the last couple of nights frantically trying to finish my chunk of the display. I put together a river canyon with a bridge running across it (I should have some photos up within a couple days). It's 144 studs wide by 48 studs deep - and 29 inches high. This is the biggest Lego model I've ever built. The event was packed. A lot of the people who came were parents with young children. That's good for the SALUG team because they are likely to vote for us as the best display in the show - the Lego is a real crowd-pleaser for kids. So, we stand a good chance of winning an award again this year. Lego, train, SALUG, AFOL, modeltrain. Zephyr Teachout has written an analysis of some potential roles that internet resources could have in increasing (in-person) community participation and "reviving civic life". internet, web, community, CalgaryJammers, meetup, ZephyrTeachout, online. Naomi Klein has put it about as clear as can be - the Iraqi people got to vote for what they want, but that doesn't mean they'll be allowed to have it. Via: Common Dreams: Getting the Purple Finger. Thanks to The Lotus Queen for the pointer. funny, humour, DogJudo, dog, dogs, judo. The Space Travelers Meetup On The Moon group has to be the weirdest and funniest Meetup group I've ever come across. As group organizer Dan Chusid said: "These people are out of this world!" The Eyes on the Screen screening of Eyes on the Prize went well last night. About a dozen of us here in Calgary watched episode one of the documentary series. I opened the event with a short spiel giving the background on the copyright issues plaguing the series - and other cultural and historical records. We then watched the film and followed it with a short discussion on civil rights activism. Update: Wired News has a good article on a Bay Area screening held last night. Update 2: Democracy Now! had a show about the Eyes on the Prize copyright issues (available as transcript or MP3). Veterans statement via: Boing Boing: Veterans of the Civil Rights Movement support Eyes on the Prize screenings. The seniors in residence at Hobart's Strathaven Home (in Tasmania) have done some incredible work producing all sorts of furnishings and objects (including a wide selection of food replicas) - entirely in yarn using knitting and crochet. See the article for details and photos. I'm contributing to a new group blog for folks in Calgary who are part of the local "Culturejammers" (Adbusters) community. Years ago, when I was first doing websites, I had a section on my personal pages about comic books - particularly independent comics. Writer & artist Josh Neufeld came across the site and got in touch with me, since we share the same last name. We've chatted occasionally since then by email, and I've made a point of picking up his work when I come across it. For anyone who enjoys autobiographical comics, his work is definitely worth a look. Anyway, he sent out a note pointing to a recent interview on the Sequential Tart site. It's primarily a discussion, including Josh's partner Sari Wilson, about the travels that Josh covers in his work. Excellent twisting of religion children's book into evil menacing alien takeover of Earth. What's particularly disturbing is how creepy the original pictures are - even without the alien twist. Via Boing Boing: Religious picture book remixed into twisted alien-invader primer.